Cardio is short for cardiovascular exercise. Technically, the main purpose of cardio is to exercise the heart and cardiovascular system, however, the main reason for its popularity is that it burns lots of calories. While cardio is important and should definitely be included to your exercise regime, don’t be tempted to lose weight through cardio alone. For best weight-loss results, focus on strength training and complement it with cardio, rather than the other way round. 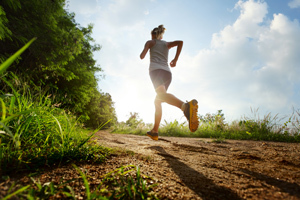 Running is one of the most accessible forms of cardio exercises. The only equipment you need is a pair of running shoes – you can get a decent one from about £60. You can run anywhere and at any time. You can vary workout intensity and achieve different results – for example, running uphill will help to develop your leg muscles, whereas sprinting would give you an anaerobic workout. Anyone can run! Unless you have an injury or a specific health condition, there is no reason why not. When people say “I am not a runner”, it just means they haven’t really tried it. Or perhaps they tried in the wrong way. The easiest mistake to make when starting running for the first time is to try to do too much too soon. You don’t have to start by trying to run three miles, or to run continuously for half an hour – most likely, this heroic effort would just leave you short of breath and sorely disappointed at your own lack of stamina. The key to becoming a runner (and any other type of athlete!) is to start slow and to start small. If you never run before, go for a session where you jog for 1 minute and walk for 4 minutes, and repeat this cycle 4 or 5 times. Next time, try running for 1.5-2 minutes. Gradually build up this time and eventually, you will find yourself running continuously for a decent period of time. Running is probably the easiest form of cardio exercise, but it is not the only one. Cycling obviously requires a bicycle, but you can use it for transportation as well as exercise, so can be a great option depending on your lifestyle. Most gyms have exercise bikes as part of their standard cardio equipment. if you tend to go for long sessions at a low steady speed, consider introducing some interval training: short periods of high intensity followed by a recovery period, cycle repeated several times. For example, interval running would involve running uphill or sprinting for high intensity, and then jogging or walking to recover. the same principle (high intensity period, recovery period, repeat) can be applied to all cardio activities such as cycling, swimming, rowing etc. if you only do cardio for your exercise at the moment, consider adding one or two strength workouts a week, to develop muscles and improve tone and shape of your body. There are many exercises you can do with your own body weight, or with basic equipment. Unless you are a high-performance athlete, you will be able to do cardio exercises on a low-carb diet without any significant difference. In the initial stages of ketogenic diets, before your body switches into ketosis, you might find your overall energy levels plummet temporarily, which might make it more difficult to go for a long or strenuous cardio session. Once you are in ketosis, your body should perform as usual, using fat for energy instead of glucose. If performance is important (for example, if you are running in a race), you might consider redistributing your carb intake that day so that you take all your carbs immediately before the event.